I have fallen in and out of love with my 'inherited' crockpot over the years. This past week - I have had a renewed interest in the crockpot and knitting. Probably due to starting a declutter exercise at home and finding things you had forgotten about that were tucked away, throughout the house. Please come on in and enjoy, copy and use whatever you like and please, I encourage you to leave comments so that we can all learn from better ways of cooking with our trusty crock-pot. A great resource if you are searching for yeast free recipes to use in the crockpot is Lori Winders recipe book "Yeast Free Cooking." These are recipes that slow cook all day, so that when you and your family are ready for dinner - dinner is ready for you! And, they are all yeast free. 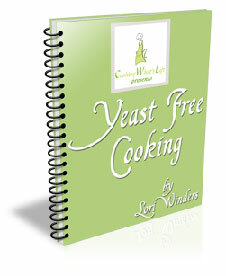 Click on the book or 'yeast free' links to go to Lori's site. I found it very worthwhile.